I have previously reviewed Rolling Thunders 1 and 3, so for some time now I have meant to also review this middle chapter in the series. I wrote a good-length summary of my thoughts on this game earlier this year for my Genesis Game Opinion Summaries list, but while I played the game for that I only beat it on Normal difficulty and stopped there. This is the last of the three games in this series that I bought and the last of the three I finished, so as a result this is the last that I review. Now, however, I have gone back and played through on Hard mode, and while I still like the first game the most, Hard mode in Rolling Thunder 2 improves the game; I like this game more now than I did before, and I’ve always liked it a lot. Rolling Thunder 2 is fantastic and I love it, so on to the review! First though, please note that I will make many comparisons between this game and the first one in this review. Sorry about that, for anyone who dislikes it, but considering that this is a sequel I think it’s the best way to go. I never mention Rolling Thunder 3, however, so just go read my review of that game to see how that disappointment turned out. I might go back to that review sometime, it could be better and I never did play most of that game through in Hard mode either. The story is told with cutscenes like this, with a picture up top and scrolling text below. Rolling Thunder 2 is a really great side-scrolling action game from Namco. For anyone who hasn’t played it Rolling Thunder is one part Elevator Action and one part Shinobi’s predecessor, though I like it more than any of those games. This sequel plays like the first one, but with some changes that make it less cruel and random. The game originally released in arcades, and I will discuss that version briefly first, though unlike the first one I don’t recall playing it in arcades myself’; I didn’t play this game until the ’00s, I believe. The original arcade version of the game has seven-ish levels, each much more visually distinct than the stages in the first game. It also adds two player co-op play to the series. Player one is previously captured Leila, and player two is the first games’ protagonist Albatross. There are two difficulty levels available too, the second reached by beating the game once, so there is more to see than the first game, you just won’t take quite as long to get through most of it due to the less cruel design. Rolling Thunder 2 is tough, but it is predictable. With practice and memorization you will learn what to do. As in the first game, there is only one boss fight in this version of the game, at the very end. The game also has one or two player simultaneous play. When it came time to bring Rolling Thunder 2 home, though the first Rolling Thunder’s home port had been on the NES, developer Namco decided to port this game to the Sega Genesis, probably because Rolling Thunder fits in very well with the kinds of games on Sega’s platform, such as the somewhat similar Shinobi series. Namco supported all three consoles that generation, the SNES, Genesis, and TurboGrafx-16, but few titles were multiplatform, as was the trend of the time particularly from Japanese developers; instead, each system’s library is mostly exclusive. This is an odd move from a modern perspective, but they thought it made sense at the time. The port of Rolling Thunder 2 to the Genesis is very faithful to the arcade game, with no content cut from the arcade game. The Genesis version adds quite a bit to the game, in fact, with three or four new levels and three new boss fights scattered across the game. You also can choose to play as either character at the start, instead of each player being locked to a specific one. The graphics aren’t quite arcade-perfect, of course, but they’re more than good enough, and the music is great. More on that later. Finally, as with the first game, the console version has a password save system which lets you pick up from the last level you have reached. In a game this hard, and it is quite challenging, that is essential! As much as I love this series, if you had to restart the games every three or six deaths I’d never have beaten any of these games; I do not so amazing that I could beat a game like this easily, and rarely have the patience to stick with and bead hard games that force you to start over from the beginning constantly. This design, a very tough but fair game with a save system, is pretty much perfect. This game is a sequel to the first Rolling Thunder, so the story and characters are related. There are two playable characters, both playable in either single or co-op modes. You can play as either Albatross, the male agent from the original game, or Leila, the captured female agent he rescued at the end of that game. This time Leila isn’t a damsel in distress thankfully, but instead is Albatross’s equal as a front-line agent. The “rescue the kidnapped woman” plot is one of the worst things in writing, so I’m very happy that it’s gone for this game, and instead you can play as either gender as you like! On this important subject, Rolling Thunder 2 is by far the best game in the series too, given how the third games’ female character can only be accessed with a code and doesn’t have cutscenes. On the subject of story, Rolling Thunder 2 has a bit more plot than the first game. The story is simple, and is told with some scrolling text between each level with a half-screen still cinema screen showing where Albatross and Leila are now. The plot is that Albatross defeated the evil organization Geldra in the first game, but they’re back! Geldra has a new leader, an evil arms merchant named Gimdo, and you’ve got to go take him down. In each mission you get closer to your goal. However, Gimdo may be taking on Geldra’s mantle, but the environments and enemies look quite different from before. As a result it feels more like you’re facing a new group, rather than Geldra again, though the types of enemies are very familiar for sure. Oddly though, while the first game has a 1960s spy movie aesthetic, this game has a modern look. Albatross looks similar to how he did before, but are these the same people decades later or new agents with the same names as the old ones? I’m not sure, and the game does not explain this as far as I know. Additionally, while in the first game the regular enemies, called maskers, wear hooded masks that sort of look like multicolored KKK hoods, this time your foes all appear to be robots. Apart from their heads the maskers do look similar to how they did before, and it is a good Rolling Thunder look, but I do prefer the look of the first games’ villains by a bit. I miss the old pointy-hooded badguys. The first level, Florida, has trucks to jump up onto instead of regular platforms, but they don’t move so it’s not too different really. Rolling Thunder for the Sega Genesis is a side-scrolling shooting action-platformer. While somewhat similar to other games such as those mentioned previously, this series has a feel all its own. The game has 11 levels, four bosses, and two difficulty levels, so there is a good amount of content here. Just like in the first game, basic gameplay involves you slowly walking to the right as you shoot enemies and hide in doors along the way. Many areas have two tiers of platforms on the screen, including the ground and then a platform above it mid-screen. You walk around with the d-pad, duck with down, fire with B, and jump with C. A is unused. A bit like a Prince of Persia-style game, this game is nicely animated, so you’ll need to press a button a moment before it is needed to account for the animation. Up will enter a door, if you are standing right in front of one. Most doors are simply a place to hide, but some give you extra ammo. These are marked with ammo symbols. Some of the seemingly normal doors will give you powerups too, however, so check all the doors! Unmarked door powerups include another hit point added to your health bar, a special weapon such as a machine gun or flamethrower, or more time added to the always-ticking countdown timer. If you run out of time you lose a life, so this is useful. The extra health is the best of these, though, as it allows you to take a hit without dying! There are three kinds of jumps you can make. Of all the things changed from the first Rolling Thunder game, the freer jumping system this game implements is one of the most important. In the first game, you cannot control yourself in the air, so once you press forward and jump you go a specific, preset distance forward every time. This time, however, you can control exactly how far forward you jump, which gives you much greater jump control and makes the jumping element of this game dramatically easier than it was previously. This is particularly noticeable in the one level with bottomless pits you need to jump over. Where the equivalent level in the first game was an incredibly hard nightmare this one is fairly easy, and the control change is probably the biggest reason why. However, but jump heights are still preset; each jump type will always go to the same height, you can only control the horizontal distance traveled. So, pressing Jump while standing will do a medium jump, high enough to make it up onto a box in front of you. You can’t go up to the upper layer with a normal jump, however; the only way to go to an upper platform is to hit Up and Jump at the same time. This will do a high jump, and land you on the upper platform if there is one there. And lastly, you will jump a lower height if you hit jump while ducking. This is much less useful than the other jumps, but there may be times it’s worth trying. Ducking itself is, however, absolutely essential! You cannot move while ducking, only fire, stand up, or drop down to the lower level if you are on the upper level. Your movement is slow and there is no run button, slide move, or anything of the sort, but this perfectly fits the nature of the game. This is a deliberate and controlled game where you memorize each area as you go, learn the enemy patterns and obstacles, and then try to get through the level without mistakes if you want to move on. I can understand how some people may not like this, as Rolling Thunder is far from Contra or Metal Slug’s fast-paced blasting, but I absolutely love these games and their spin on the genre. The health system in this game is similar to before. You have two hit points, the same as you do in the NES version of the first game. In the first game you lose one hit point if an enemy touches you, or two if you get shot. This game is mostly the same, but there is one big change that makes things easier. If an enemy punches you or hits you with a grenade, you lose one hit point. If you get shot, you lose two. If you touch an enemy when they are not punching, however, you do not lose health. When you take a hit or touch an enemy who isn’t attacking you will bounce back a bit, but in the latter case you won’t take damage. This is a change from the first game, as in that one any touch against an enemy’s sprite automatically took away half your health. And on top of that, when you touch an enemy or take a hit you have a moment of invincibility. If enemies shoot or punch you during that instant the hits will not count. This situation is dangerous of course, as a gap just a bit too long between attacks will end the invincibility and hit you, but still, this is an incredibly useful change which makes level navigation much easier than it was in the first game. Where before you had to avoid all enemies all the time, now sometimes you can jump or drop onto an enemy, bounce off of their back towards a door or something like that you want to reach, and get to safety before they can turn around and attack you. It’s great. So, unless you find a hidden extra-health powerup, one bullet kills you. Enemy bullets will pass through their compatriots, so watch out for guys in the back! Oddly, though, enemy grenades WILL kill other enemies, and this can be useful at times. The limited health and constant danger help create the constant sense of tension that is part of what makes these games so great. You’re a spy infiltrating an enemy base, so while the game centers around combat you should avoid some foes, in Hard mode particularly. Hiding in a hidey-hole, fighting the sniper enemies. Combat in Rolling Thunder 2 is great fun. Jumping while ducking may not be too useful, but ducking itself is perhaps the most important core element of combat in Rolling Thunder 1 and 2. Ducking under enemy attacks and shooting them from down low is strategy number one in this game, as most enemies only attack at chest-height. You can’t get too comfortable, though, as you do always need to watch out for enemy types who attack low or use grenades. As before your main weapon is a pistol, and there are a few special weapons scattered around in certain levels for greater firepower. Enemies come at you from both sides, and occasionally also from above. Enemies spawn once you reach specific points in the level, so you can’t wait around for them to appear, you will need to move forward to trigger them, or inch forward if you don’t know what is coming. Again, this game is all about learning enemy patterns. You will need to learn which enemies appear from where, and also what each enemy does. While most enemies just move forward across the screen, attacking you if they see you, some pace back and forth across a small area. That latter type is the more troublesome, because the other type of enemy can often be avoided. Your enemies are numerous, and mostly similar-looking. The series’ trademark color-coded masker enemies return, with their robotic design overhaul, and as before it is incredibly useful to know at a glance how many hits an enemy will take and whether they will attack high or low. Enemy types include basic green badguys, who will only ever attack high and may have a gun or grenades; pink ones who attack low, but only take three hits; black-ish ones which take six shots to kill; and more. Regular enemies include seven kinds of regular maskers, two animals, and the three special masker types. This time most enemies are humanoid, though; only three levels have enemy animals in them, one level each for bats, dogs, and cats. There are some special humanoid enemies in a few levels, including armadillo-like guys in one stage and snipers and a special radioactive-hazard masker you must shoot in the back to hit in a few stages, and those are all decent additions that mix up the gameplay. Still, compared to its predecessor a higher percentage of the enemies in this game are standard masker types. That’s alright, though, as the very frustrating large flying bird enemies from the first game were a real pain and hard to fight. Removing them in favor of a mostly humanoid enemy set was probably a good move. It may be yet another factor in reducing the games’ difficulty, but it does make it more fun. Indeed, avoiding enemies is often the better strategy here when you can! Whether you enter a door to hide behind it, go to the other level of the screen to stay away from tougher foes above or below, or just hide crouching behind a box as you wait for enemies to pass by overhead, any enemy you don’t need to fight is some bullets saved for more important targets. Just make sure that you aren’t spotted, however, because if you are seen then enter a door, some enemies will stop and wait for you to appear again, instead of continuing to move on across the screen. Ammo management is particularly important in the last level as the game, as you will need to save every bullet you can for the really hard final boss fight, but it is useful throughout because of how harsh the penalty for running out of bullets is. On the subject of ammunition, in the first game, if you run out of ammo that’s it, you can’t attack at all. This time you do have an attack when ammo runs out, but it’s very limited: you can still shoot, but you shoot extremely slow-moving bullets, and, worse, can only have one bullet on screen at a time when out of ammo. You only start with 40 bullets, so while you will get occasional refills in the marked doors, if you try to kill every enemy in every level you will surely run out and be in trouble, particularly in the second loop, hard mode, where there are more enemies but not more bullets. As I played through hard mode I got better at stealth, particularly in that last level where the key to victory is avoiding as many enemies as you possibly can. It’s fun to watch the silly badguys run across the screen and jump to their doom off a platform as you hide in a room nearby. The four bosses in the Genesis version of Rolling Thunder 2 are a varied bunch, and adding them in was a great idea. Rolling Thunder is great with only the one boss at the end, as the first game and the arcade version of this game are, but having more bosses makes things a bit more interesting and mixes up the gameplay. They also provide some of the stiffer challenges in the game. The bosses are a large robot with a targeting laser, an attack by a huge number of regular enemies, four turrets which shoot at a box marked with a moving target sight you’ll have to stay out of, and, at the end, the final challenge: Geldra himself, a robot who shoots instant-death lasers at you. The Geldra fight has two phases, a first where you just jump over small laser blasts and a second where you will need to memorize the pattern of screen-crossing laser beams if you want to survive. These lasers block your shots too, so shoot as much as you can when he is vulnerable. It’s very tough, and you need to redo the whole level each time you fail because there isn’t enough ammo after the checkpoint to have a chance, but it is incredibly satisfying when you finally beat the guy and win, so it’s a great boss fight despite the frustration. The two player mode has a few quirks. This is the only Rolling Thunder game with multiplayer, and it actually works pretty well. Both players have their own lives, but in two player the A button does something, to enter the game again if you ran out of lives and game over. This takes one of the other players’ lives, though, so you can only do it if they have lives left. The number of enemies is the same as in one player so the game is easier, but both players share ammo so you can’t just run and gun or both players will be in trouble. In this thinking-persons’ shooter, it’s good to encourage that in co-op as well. This isn’t the best co-op game around, but it is a good one when playing with someone willing to learn the game. As for the two difficulty levels, unlike the first game where the hard mode is pretty much just the second half of the game, this time Normal and Hard are each the complete game, it’s just a lot harder the second time. You need to beat Normal to get the password for the first level in Hard. Like in the first game, in Hard mode enemies take more shots to kill and all enemies who don’t have grenades will shoot at you. Normal mode here is a bit easy compared to the first game, the final level excepted, so I find Hard mode the more satisfying one to play. It’s a great challenge. On the whole, Rolling Thunder 2’s gameplay is fantastic. Easily one of the best action games of the generation, Rolling Thunder 2 takes a great model and improves on it in some key ways. Allowing you to touch enemies without taking damage, giving you much more jump control, and having a limited zero-ammo attack, and adding in two player co-op play all ease up on the first games’ stiff challenge, but this game is still plenty hard thanks to tough enemy placements and some hard bosses. This is mostly good, but for whatever reason the cruelly unfair design is part of why I love Rolling Thunder, so this is both good and bad. The level designs themselves have also been made a bit less unfair. I will discuss that subject next, along with some interesting level design elements seen in some stages. In the eleven levels in this game, you travel through various locations as you seek out Gimdo’s secret base. You start out in Florida, seeking out a mansion owned by Gimdo. The first level is a nice introduction, as it has a simpler layout than the remaining levels do. Here you travel down a road, walking along or jumping up onto some large trucks. It nicely eases the player in to Rolling Thunder design. After several levels there you move on to several more locations, including Egypt, a base in a cave, and some indoor installations in the style of the levels from the original Rolling Thunder. I like the level variety, it adds something to this game versus the very similar-looking stages in the original. I already covered many elements of level design above, including the way levels are mostly made up of two tiers of platforms, ground and platform above, that you jump between. Both are usually a flat surface, outside of the cave level, but boxes, vehicles, or other obstacles scattered around will block your, and your foes’, path. A few stages have obstacles you can duck inside for cover, as well, like the tires from the first level of the original game. Most levels are a single screen high path forward, but a few do have elevators or other points where you must jump up or down a screen or more. I always really like these areas, because as much as I love them the game does need some variety from the straight corridors. I think that the first game might have more of these areas than this one does, but while in Normal they aren’t particularly interesting, they are fun challenges in Hard mode. In Hard mode dodging the bullets and grenades that enemies on the sides of these platforms or elevators toss at you can be difficult. Everything in this game is, of course, very predictable, so things will go very similarly in a level if you take the same actions, but enemies can take slightly different actions depending on your or other enemy moves, so you do need to keep on your toes even if you’ve played a level a dozen times before or more. Indeed, Rolling Thunder 2 levels mix things up nicely. Most levels have the usual two-level design that is signature to this series, but as in the first game some areas require you to be on the ground. This forces you to face a specific wave of enemies, to keep the player from just avoiding everything. Areas with no doors or blocks and waves of enemies essentially require memorization to get through, even more so than the rest of the game does. The Egypt levels also have some background areas you can move into, a second layer on the ground that has its own doors and such in it. The first game also has some segments like that, particularly in its original arcade incarnation, but the NES version cut many of them out versus the arcade original. This time, everything from the arcade game is here, so there are no cuts. While there are green screens separating the two layers the game does not actually switch to a separate view so trying to figure out if enemies are shooting in the background or foreground can be occasionally confusing, but this is rarely an issue. And I like the addition of doors in the background areas, the first game didn’t have that. While full background passages are only found in the few Egypt levels, several levels have static locations in the background that you can hide in. These are kind of doors without a doorway, so you cannot move around in them, but they do let you pop in and out of cover faster than you can from behind a door. One level makes good use of this, as you fight enemies which shoot deadly laser blasts at you and also hide in cover by utilizing cover points effectively. You need to shoot them when they pop out to shoot at you, so act quickly! The other unique level design element I need to mention again is the level with jumping puzzles in it. While ten of the eleven levels in this game have no instant death pits to jump over, there are some in one indoor Egypt level. The first game had several segments with jumping puzzles, but this one is longer than those in the first game so that could make up for that. However, thanks to the improved controls that give you control over how far forward you jump, this level is far easier than those before. As with many elements of this game, I really appreciate the better jumping here and love this game, but I do also miss the harsh challenge of the original title. The platform-jumping level is one of the hardest and most frustrating things in the first game, but here the equivalent level is a fun little romp I got through quickly on both difficulties. On Hard there are a lot of little flying bats or birds attacking you in this stage, but they’re far easier to avoid than the nasty dividing fire-bats from the first game that love to knock you into the pits, so that eases up on the challenge as well. The last level is tough, so hide in a door when you can. I have mentioned this previously as well, but the last level is a fascinating challenge. The previous bosses can be tough, but the last boss in this game is one of the hardest moments in any game in this series. I described the fight earlier, but while the first phase isn’t too hard with practice, the second is incredibly challenging if you don’t have at least 60-plus bullets left when you reach that phase of the fight, because if you run out of ammo you never will survive long enough to kill him with slow bullets. The problem is, the last level is quite long and in Hard mode particularly is absolutely loaded with enemies, so I had to work on my avoidance techniques to beat this level. Dodging guys by jumping to activate enemies, going back down to get out of their way, then back up to move past them work, but can be tricky when you’ve also got other enemies you haven’t killed behind you, ready to shoot you in the back! And even when I did do well at avoidance in the first half of the level, after killing most enemies in the door-free second half I never had anywhere near enough ammo at the end. But after spending days failing to get through this level, I finally realized that ducking behind boxes in the second half was the key, as many enemies would just jump over them and move on. And with that I reached the final boss with plenty of ammo, and beat him surprisingly easily once I finally didn’t mess up. Just make sure to have over 100 bullets when you reach the final boss and you should be okay. It’s a really hard level, but as frustrating and aggravating as it was, I loved the challenge and the effort was all worth it in the end. On that note, I need to get back to the issue of cruel and unfair level design. One part of why I love Rolling Thunder is that at times the game requires you to be near-perfect in order to get past a section, but you have the abilities to meet that challenge. Once you beat a stage (or two, for the first half of the first game) you’ll get the password for the next level and not need to go back to the last one, crucially, so each level or two is an individual challenge, but you need to be good and learn what to do to get through. However, the first game has some sections that essentially rely on luck. When you need to drop down to a lower platform with an enemy patrolling back and forth, there is often nothing you can do but hope for good luck, which is unlikely, or back up a few screens and try to get things just right so that the enemy in question disappears. This time, most of those elements are gone. Normal difficulty has pretty much none at all, in fact! Hard mode, unlocked by beating the game once, is a lot tougher, but the addition of the ability to touch an enemy without taking damage completely changes the equation in situations like that one. The strategy of retreating to make enemies vanish actually does still work, amusingly enough, but I only had to do that once in this game, in the cave level. That cave level has uneven floors which make getting through some areas without taking a hit tricky. But for the most part, with practice once you have learned a section of a level, with the right strategy this time you should be able to get through it regularly without needing such techniques. Normal is too easy, but this game in Hard mode is near-perfect Rolling Thunder design. Visually, Rolling Thunder 2 is a good but not great looking game. This may be an accurate port of the arcade game, but this game wasn’t pushing hardware, not with these graphics and its slow pace. That said, the game does have some pretty good-looking backgrounds, parallax layers in the backgrounds of many but not all levels, and nice variety in settings and environments as you progress. I don’t know if anything here looks amazing, but it all looks good, as the screenshots in this review show. The sprite work is similarly good. I may prefer the original pointy-masked average badguys, but these more robotic ones have good designs too. Again, apart from the few animal enemies in a few levels almost all enemies are slight redesigns of one basic design, but that fits the theme of an evil organization’s goons perfectly so I am entirely fine with that. I also, again, really like the decision to let you play as either a male or female character. Albatross and Leila’s sprites both have good designs and outfits which fit spy action movie characters well. She isn’t too over-sexualized either, which is good. As for the music, Rolling Thunder 2 has a very good, catchy soundtrack. Namco did pretty good work here, and every track sounds good. This music does not push the Genesis’s sound hardware to the limit, but the chiptunes that are here sound very good and mostly hold up well under repeat play. If you get stuck in a level for a particularly long time some songs may get old, but even after days of trying I was still mostly enjoying the last levels’ theme, so the music is great. 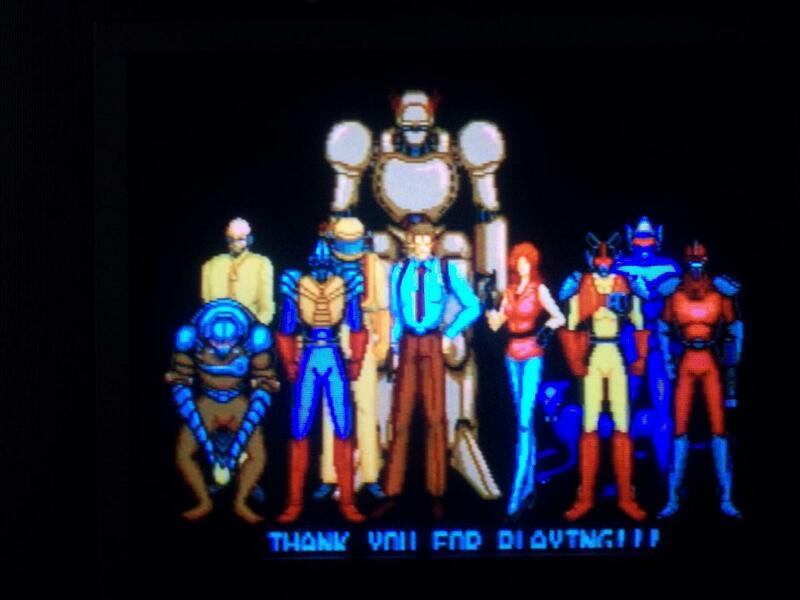 In conclusion, Rolling Thunder 2 is an absolutely fantastic game, and one of the better games on the Genesis for sure. This system has a lot of games sort of like this, perhaps most similarly Shadow Dancer: The Secret of Shinobi, another favorite of mine, but based on its fantastic gameplay and level designs, Rolling Thunder 2 is one of the best. This game was made easier than its predecessor Rolling Thunder 1 (for the arcade and NES) in many ways, though. The changes including better jumping controls, less unfair enemy placements, not having you lose health when you touch an enemy who is not attacking you and adding a bit of invincibility on that touch, a fairly easy first run though the game in Normal mode which lets you see the whole game, and some more. All of these changes make most of this game easier to get through than its predecessor, though the very difficult final level will keep you trying for a good while before you finally see the ending. I really loved my time with this game though, and beating it in Hard mode as well as Normal was absolutely worth it! When you finally get it right, take all of the enemies down without mistakes through both avoidance and killing certain enemies you need to without getting hit by any of their attacks, it is incredibly fun and rewarding. I may still slightly prefer the first Rolling Thunder, that all-time classic that is my favorite Namco game, but Rolling Thunder 2 is very nearly as great. This game gets an easy A grade and I very highly recommend it. In either single player or two player co-op Rolling Thunder 2 is exceptional, play it! This entry was posted in Classic Games, Full Reviews, Genesis, Reviews and tagged Genesis, Namco, Rolling Thunder, Rolling Thunder 2, Sega. Bookmark the permalink.